Nucleosomes and nucleosome remodeling factors are crucial to human health. Aging, for instance, deranges the nucleosome landscape destabilizing the genome, and mutations in nucleosome remodelers are drivers of cancers. Nucleosomes serve both as barriers that restrict access to the genome and as a medium that accumulates epigenetic marks. The locations of nucleosomes in the genome are therefore precisely controlled by ATP-dependent nucleosome remodeling complexes. 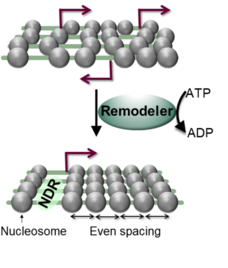 Remodeling complexes move, assemble or eject nucleosomes in an ATP-dependent fashion. Some also can even out the spacing between nucleosomes and set a characteristic nucleosome-to-nucleosome distance. These ‘spacing remodelers’ thereby generate arrays of nucleosomes with a surprising regularity. Remodeling enzymes set up the canonical nucleosome organization of genes. In an ATP hydrolysis-dependent manner, remodelers open up a ‘nucleosome depleted region’ (NDR) and generate an array of nucleosomes with even spacing downstream of the transcription start site (arrow; bottom). Without remodelers (top), cryptic promoters open up leading to spurious transcription. The omnipresence of nucleosome arrays across eukaryotes suggests important functionality. Our overarching aim is therefore to elucidate their biogenesis and dissect their biological function. We bridge methodologies of molecular biology, genetics, genomics, systems biology, biophysics, structural biology, and enzymology. We also develop cutting-edge technology that allow us to visualize individual arrays in single cells, deduce system properties of tens of thousands of nucleosomes by systematically manipulating array structures in vivo, and dissect the mechanism of nucleosome remodeling genome-wide in vivo and in vitro. What follows is an overview of selected topics of the lab. Despite intense efforts, there is a dearth of structural information about remodeling complexes. Reasons lie in their compositional complexity - they often form megadalton complexes - and structural plasticity. Using innovative hybrid approaches, we aim to deduce the architectures of these remodeling complexes and their conformational cycle. More specifically, we use an integrated approach of protein crosslinking, high resolution mass spectrometry (MS), structural modeling. In this technique, we map the amino acids that are involved in any one crosslink by high resolution MS. Cross-links in the MS datasets are identified by the software “Crossfinder”, which we developed for this purpose (Click here to download the software 'Crossfinder'). The structural information provided by these crosslinks is then used to “stitch” together existing structural models of domains and subunits by computational docking methods. We expose the conformational cycle of remodelers and the regulatory framework that orchestrates catalysis with mechanistic biochemical and biophysical approaches, such as fluorescence spectroscopy, electron microscopy and quantitative structural mass spectrometry. How strongly condensed heterochromatin is established, maintained or dissolved is subject of intense research. 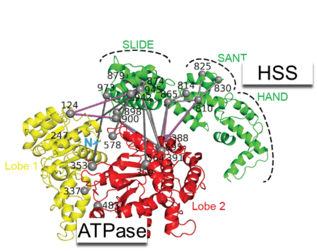 ATP-dependent nucleosome remodeling complexes facilitate these structural transformations by catalyzing changes to the composition or positioning of nucleosomes. These nucleosome remodeling factors however face one dilemma: How can they access and then remodel tightly folded chromatin structures? We develop innovative tools and approaches to shed light on this question. To this end, we reconstitute folded chromatin or purify physiological heterochromatin and study remodeling in vitro and in vivo using a combination of established next-generation sequencing (NGS) techniques and highly innovative single molecule sequencing methods. The results will contribute towards our understanding of how ATP-dependent chromatin remodelers deal with tightly folded chromatin and how they control the packaging and dynamics of heterochromatin. Remodelers mobilize nucleosomes in vivo and thereby sculpt the characteristic nucleosomal organization of the genome. How they are instructed what, where and when to remodel is largely unknown. We test mechanistic hypotheses in vivo in yeast by employing a battery of incisively mutated versions of remodelers that lack certain functionalities. By chromatin immunoprecipitation and next generation sequencing we uncover the associated molecular phenotypes. Besides providing critical tests of concrete mechanistic hypotheses, which were derived from in vitro approaches, these experiments tell us which elements of the remodelers are necessary for sliding nucleosomes in vivo, for sufficient nucleosome affinity, for specific recruitment to a subset of nucleosomes, for proper nucleosome positioning, for formation of nucleosomal arrays and for the characteristic spacing of nucleosomes.